Taunda Mope,15yr old Grade 4 student who lost his parents and four siblings along with four other relatives to the earthquake in Hela province. 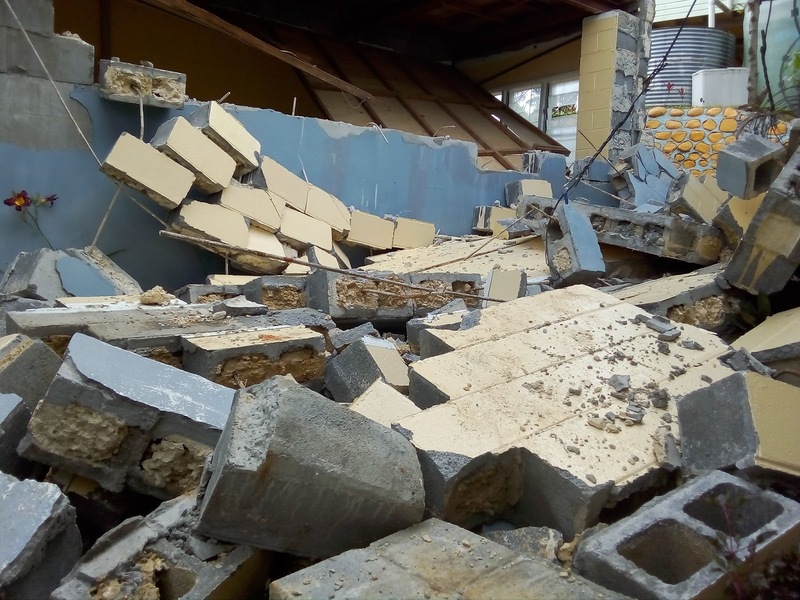 Taunda Mope, a grade 4 student at Tango Primary School in Magarima was on his way to his family for the weekend when the 7.5 magnitude earthquake shook his Timu village in Hela province in the early hours of Monday 26th February 2018. Taunda arrived at his village on Tuesday morning only to found out that his village has been destroyed by the earthquake. His family home was nowhere to be seen. Debris including rocks and trees have covered more than 20 houses, gardens and hamlets belonging to his Kandele tribe. 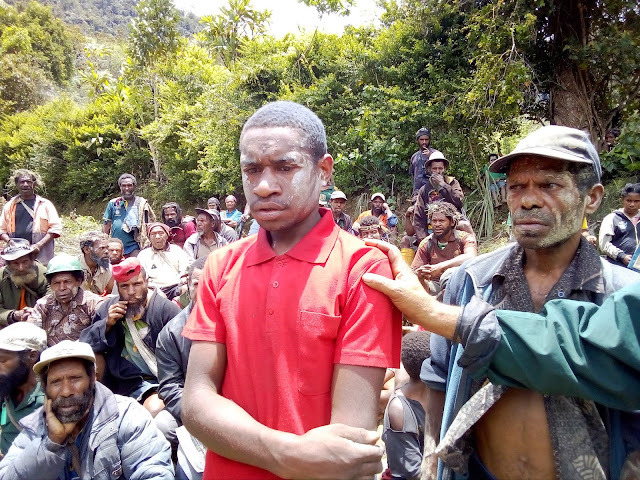 His parents including four of his siblings were among eleven poeple that were buried under the debris caused by landslips. The burial site of the four recovered bodies at Limu village. "It was around 4am in the morning when we felt the earthquake, it was the time of the morning that everyone was fast asleep," recalls Joel Wai a relative to Taunda. "We could here the landslide approaching along with rocks and trees, we started running out in the dark in fear of our lives." Soon afterwards, the villagers started calling out to their family members in the dark. Dawn was breaking and they could hardly hear birds chirping or even see their pigs in sight. All their homes have vanished after the landslip. Most of the people who were buried in the landslip were women, young children and two babies. Four bodies out of the initial eleven have been retrieved from the disaster site. This includes a young mother and her two children (ages 2 and 5years) and another 15year old girl. Local villagers are doing their best to retrieve the seven bodies. A week has gone and they are still hoping to find them among the debris. "We cannot leave this place, even there are dangers that the village is likely to be buried if the next earthquake or landslide occurs. We have lost our homes, our gardens, pigs and family members, we are willing to die with them if don't locate their bodies sooner." Taunda couldn't speak in Tok Pisin, but as translated to me, he has no hope of staying back in the village. He purposely came home to see his parents to sort out his school fees, but with their untimely death he is in a confusion state on who will assist him. Limu is one of several villages in the Hulai LLG of Komo-Magarima. The LNG Gas pipeline runs a few kilometres from the village, but there are no schools, clinics, communication towers or even a road connecting them to the provincial capital Tari. It's neigbouring Homapawa village has also confirmed 10 deaths and are in dire need for relief assistance. Today the Taunda and his 674 tribesmen and women are camping at their local church building. The only building in the village that was not destroyed by the disaster. There are in dire need of food, fresh drinking water, clothes and shelter. The aftershocks brings keeps them up everyday and night as they wait on when relief supply and support will reach them. 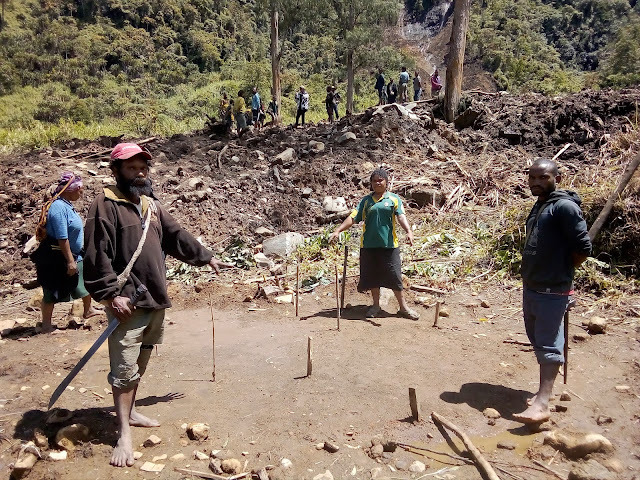 Locals at Limu village in Komo-Magarima standing at a burial site where a woman and her children were killed during the earthquake. Thousands of people have been displaced and are still waiting for relief assistance in disaster affected areas in Hela and Southern Highlands provinces a week after the 7.5 magnitude earthquake destroyed their homes and food gardens in the early hours of Monday 26th February. Aftershocks below 5 magnitude have been experienced in the last 7 days with locals on high alert and awaiting relief supplies and assistance in evacuations to safer grounds. Hela Provincial Hospital in Tari confirmed a total of 38 deaths and 8 unconfirmed deaths this afternoon (Monday). Today a medical team was deployed into Limu and Homapawa villages in the Benere ward area where a a total of 21 deaths were confirmed. Homapawa village confirmed 10 deaths and Timu 11. 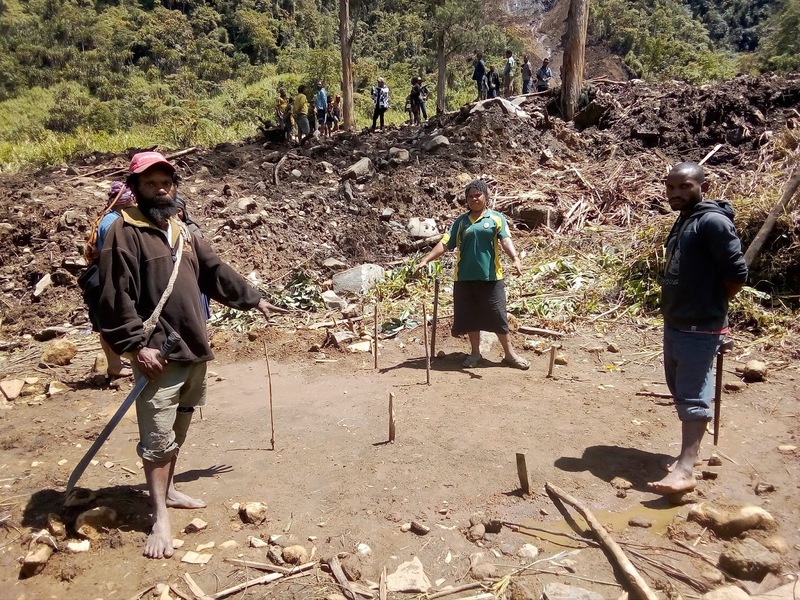 Of the 11 in Timu, 4 have been retrieved and given proper burial while another 7 (a family of six and another teenage girl) are still buried under the debris along with their house. Efforts by locals to retrieve their bodies are slowly progressing at this stage. Timu villagers who have lost all their houses and food gardens are now taking refuge at their local EBC Church building in the village. Locals at Limu village at the disaster site where bodies of an entire family of seven are still buried under the debris. 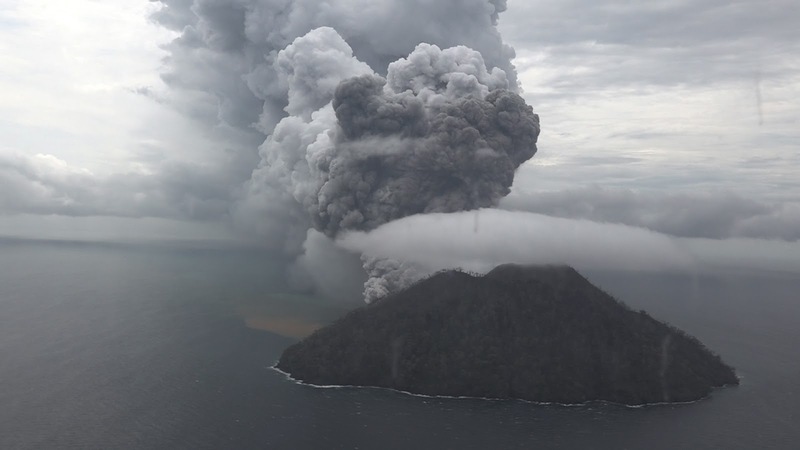 Another 12 confirmed deaths have been reported at the Mt Bosavi area I'm the Komo-Magarima district of Hela. Nearby Mananda village also reported 5 confirmed deaths and houses and food gardens destroyed by the disaster. Health officials are yet to verify uncomfirmed reports of some more deaths in Magarima and Pandoka. So far Hela province has reported a total of 38 confirmed deaths while Southern Highlands has reported 37 deaths so far. This now brings the death toll to 75 as at this afternoon (Monday). Affected communities are facing severe food, clothing and fresh water shortages as relief efforts are slowly progressing at this stage. Most of these villages in Hela are situated along the pipelines areas of the oil and gas plants in Southern Highlands and Hela provinces. 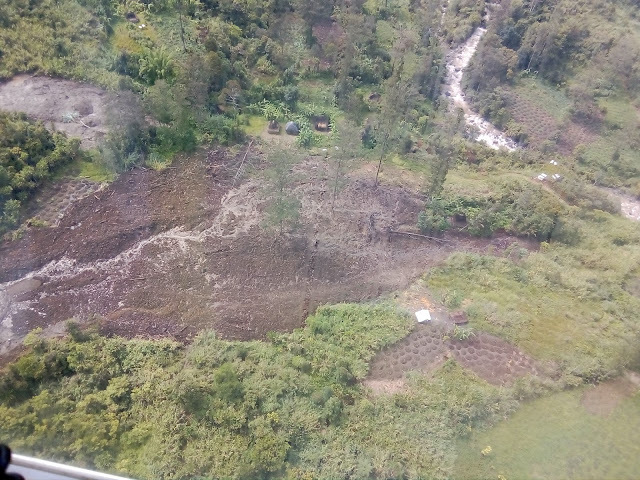 Aerial view of Limu village in Komo-Magarima showing the earthquake damage that killed 11 people. Humanitarian relief agencies are also doing their best to get into affected communities which most communities are inaccessible by road or the road links cut off by the disaster. Oil Search Limited has committed K6million in cash and kind towards the disaster while EXXON Mobil has committed K3million towards relief assistance. Oil Search has already began distributing relief supplies to parts of Southern Highlands while relief supplies were also delivered by the Australian Defence Force Hercules aircraft to Moro in Hela. The National Disaster Centre in a statement released today says they are still waiting for accurate data to reach them so that they will act accordingly. However people from the affected communities have plead for the government to fast track relief assistance and also address resettlement issues in due course as they are still in fear following aftershocks in the last 7 days. The road trip to Tari began at 10am from Mendi as we drove into areas that were affected by the earthquake in the Southern Highlands and Hela provinces. 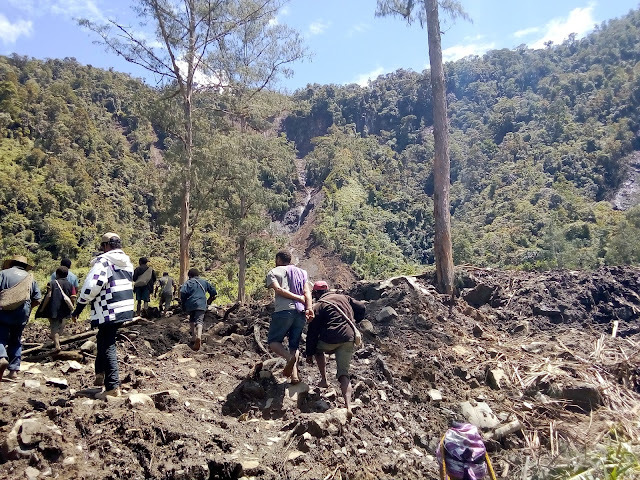 Parts of the roads in the Southern Highlands province were partly blocked by debris from landslips caused by the earthquake. At Poroma we were confronted by some men at a roadblock armed with bushknives and a shotgun charging K200 for every vehicle that passes through the section. We handed them K100 they refused to let us through and demanded another K50 to be paid. Upon payment they removed three huge boulders they've used to block the road with. We went on through to Nipa station, the roads weren't in good condition either. We were anticipating another roadblock as we drove past. For most of us on board it was a first-time experience for us to have traveled through a roadblock in the Highlands of Papua New Guinea. We drove passed Tari gap into Ambua where we were stopped just before Dauli bridge. A fight has erupted and two people were shot by the enemy faction just minutes before we arrived. The incident occurred during a "rausim haus karai" ceremony of a child who was killed during the earthquake on Monday. It was an unfortunate incident to have transpired during a time of disaster in the province. 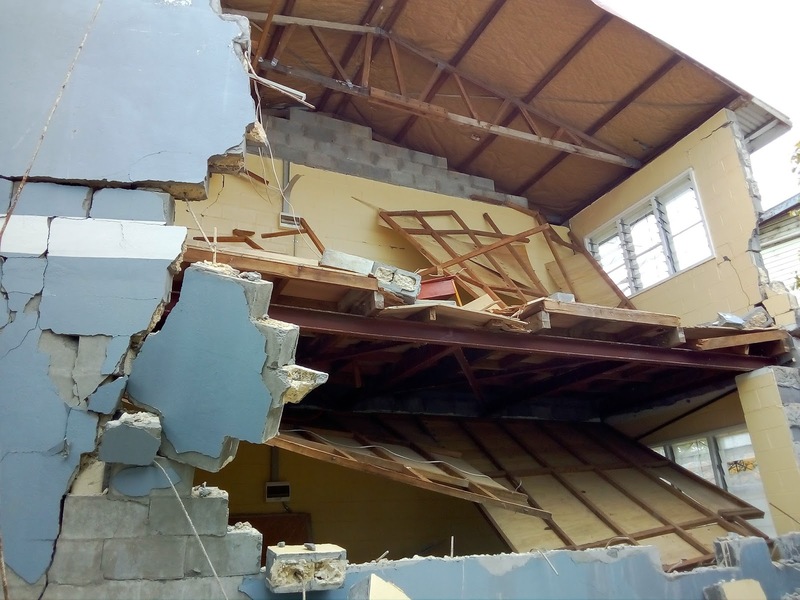 So far Tari hospital has reported 16 deaths from the disaster and it's expected to increase as reports are still coming in. 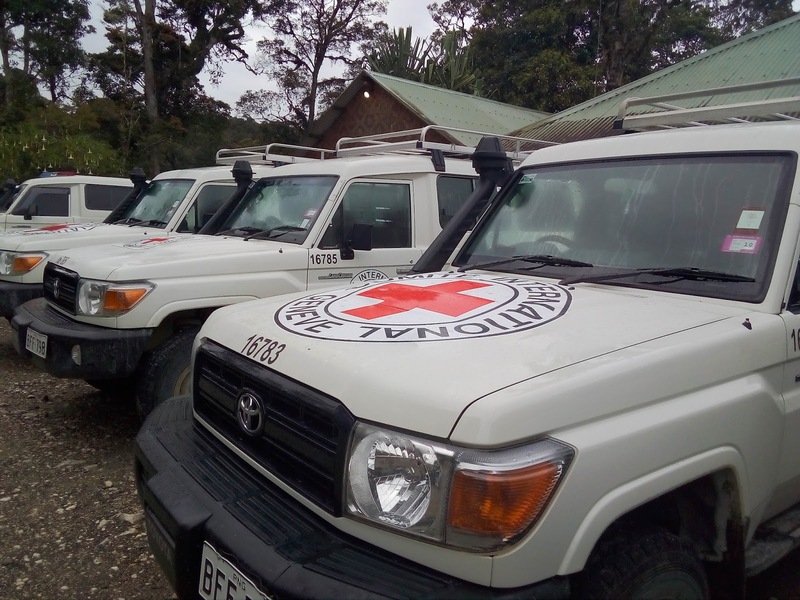 More than 200 volunteers (mostly public servants) have been engaged by the Hela Provincial Disaster team to assist in providing assistance and support. 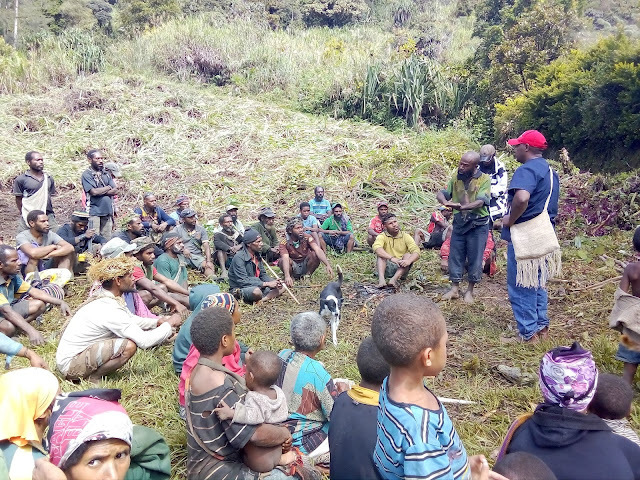 Hela political leaders James Marape, Petrus Thomas and Governor Philip Undialu have held discussions with the disaster team on how to act on addressing the issue. There have also been 37 confirmed deaths in Southern Highlands and 25 unconfirmed deaths reported. The death toll is expected to increase in the coming days as rescue efforts continue. 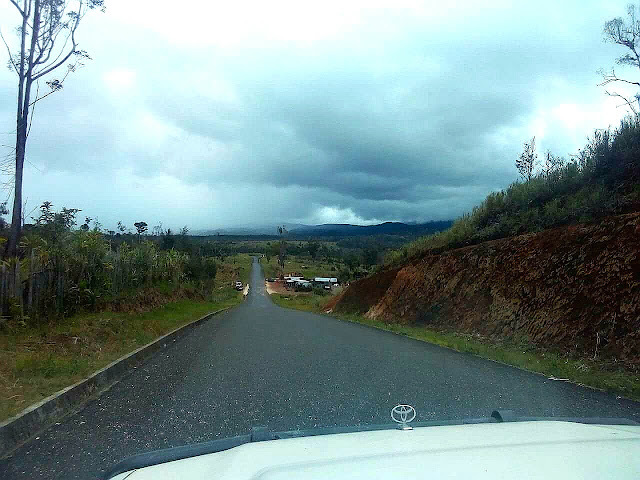 Section of the Highlands Highway between Giluwe and Iallibu in the Imbongu district. My journey to Mendi Southern Highlands province began with a 5am dash from Lae on a landcruiser with four passengers on board. We enjoyed a good two hours drive to Yonki and then navigated through bad road conditions to Goroka. Road conditions between Goroka and Kundiawa weren't that bad with sections at Chuave being upgraded and sealed. The dusty road from Kundiawa passed Mingende all the way to Barawagi desperately needs upgrading. We stopped by at Mt Wilhelm lodge to take a breather, earthquake aftershocks caught us by surprise as we left Kundiawa. Grey clouds approached us as we head into Jiwaka. Jiwaka sections of the highway from Waghi Bridge towards Minj needs to be expanded as houses and gardens have lined up the roadside. Vehicles trying to avoid potholes can easily collide or crash into the communities. Rain closed in on us at Kuli Gap as we heard into Mt Hagen. The scars from Monday's earthquake prominently shows on the hillside as we drove past. Vehicles lined up and moving at a snail pace negotiating potholes and a heavy one way traffic along the main highway. The proposed four lane highway promised by the National Government since 2013 is yet to come to reality. Mt Hagen market is another pigsty. Debris from food wastes and betelnut spittles formed another layer on top the part bitumen road. It was 3pm as we arrived at Hagen Central and headed for Rabiamul Catholic Mission where we will camp for the night. I headed straight for the bed for some well deserved rest. 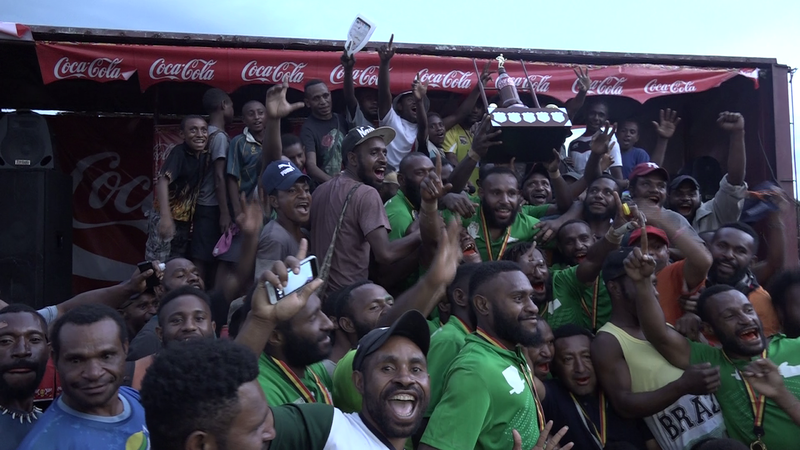 Things in Mt Hagen didn't quite changed in the last decade. An international airport without better roads and responsible citizens all caused by petty politics in the province. It is an hell of an experience for a new comer into this once prestigious township. The Catholic and Lutheran Churches along with other Pentecostal denominations are doing their best to upkeep the city. The town council is not that effective that the Central Business District is becoming filthy with rubbish. Kaiwe Market seems to become a breeding ground for drug addicts and a pigsty filled with petty criminals and street peddlers. The next day we got ready and set for an hour drive to Mendi. The road from Togoba junction in Tambul Nebiliyer was sealed all the way to Iallibu. Imbongu roads from Kaupena has been given little upgrade over the last five years. We drove up to Walume junction, O'Neill highway led on to Ialibu-Pangia as we drove up to a place where the sun doesn't shine and look across to Lake Ialibu-Pangia and the site where the proposed university will be built. Drizzles of rain led us down to Mendi Valley and into Mendi town. A peaceful setting as we drove looking down at Wara Mendi and into the township. We arrived at the Mendi Catholic Diocese centre where we were treated to a delicious dinner courtesy of the Catholic brothers in Mendi. Got our stuff ready, visited a couple of sites in Mendi destroyed by the earthquake and we are back to planning our trip to Hela. Mendi and Southern Highlands people are peace loving citizens, it's just petty politics that divides the people. 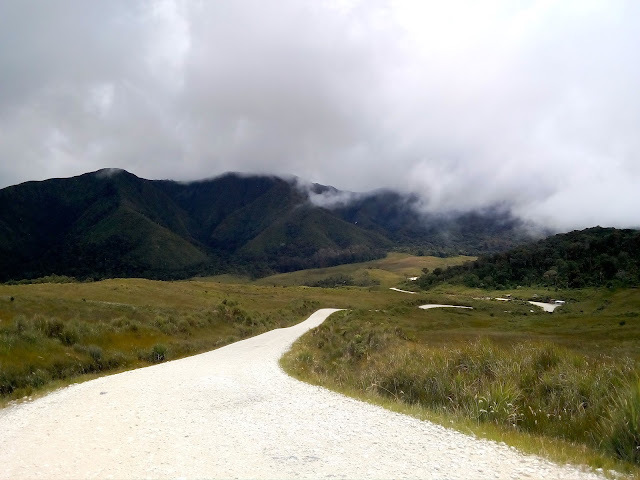 Join me in my next trip to Hela to read about part two of my Highlands Highway diary.